I never have been a huge fan of Mondays (who is? ), but I was very eager for today’s post to publish for two reasons. For one, I’ve been dying to wear and share two new pieces that I picked up recently from J.Crew and Kate Spade. 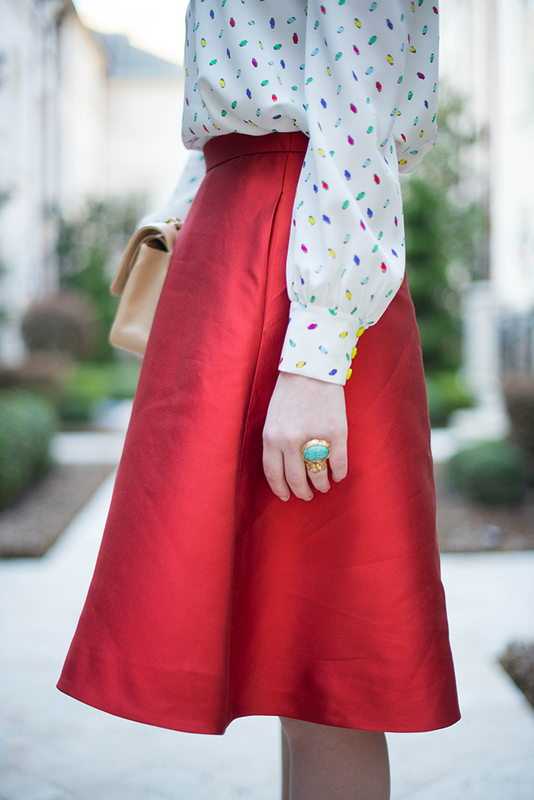 This skirt by the ever-impressive J.Crew Collection is a new obsession of mine. The color is so rich and the fabric is so luxe, while the silhouette is feminine is sophisticated. I dressed it up here, but I plan to style the skirt down with a tank and big statement necklace this summer. Did I mention it has pockets? Please and thank you. 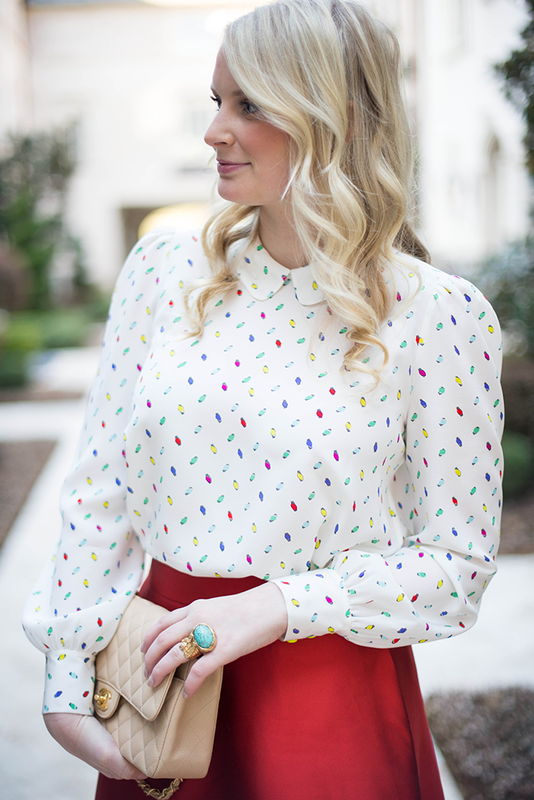 This Kate Spade top is one I picked up in their Madison Ave boutique during fashion week and reminds my of a candy shop. All of the bright colors and the cute print make it pretty easy to wear with whatever. The second reason I was excited for today is I am partnering with Kendra Scott for a giveaway! 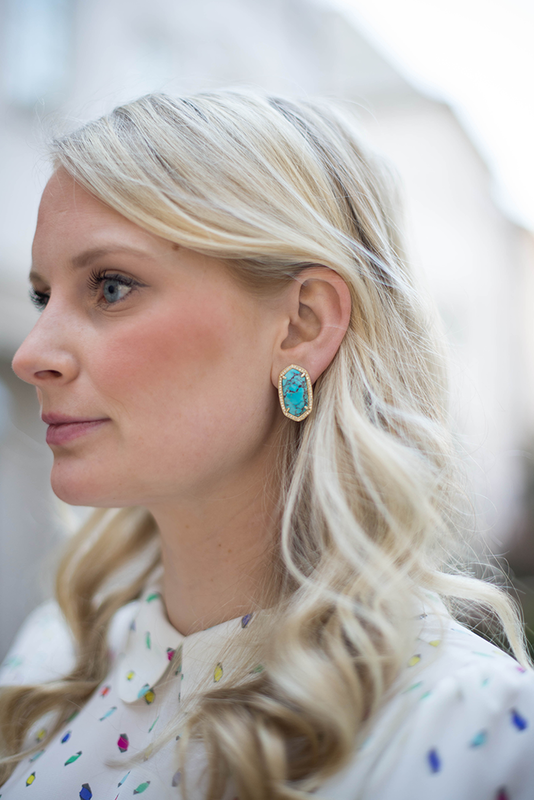 I’ve been drooling over this pair of earrings since Kendra Scott’s new LUXE Collection launched this past fall, and this week one lucky Style Scribe reader has a chance to win a pair! Enter using the Rafflecopter widget below by Friday at 5pm CST! This giveaway is open to US residents only. Click here to check out the rest of Kendra Scott’s LUXE Collection today! Lovely look! Was just in Kate Spade over the weekend, they have some really adorable pieces right now! That skirt is to FREAKING DIE FOR! What a stunning, stunning piece! gorgeous!!! You look amazing. I, too, am forever obsessed with all things J.Crew! 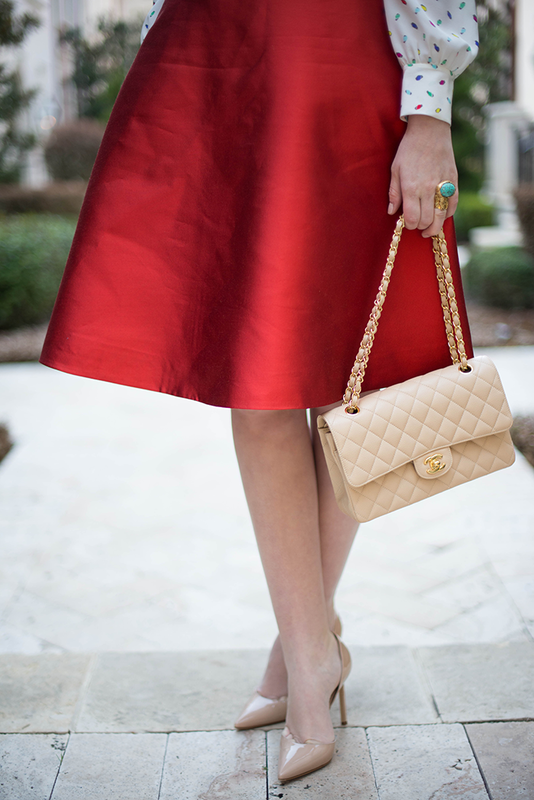 Love the color and sheen of that skirt! Such a great shape for you too. 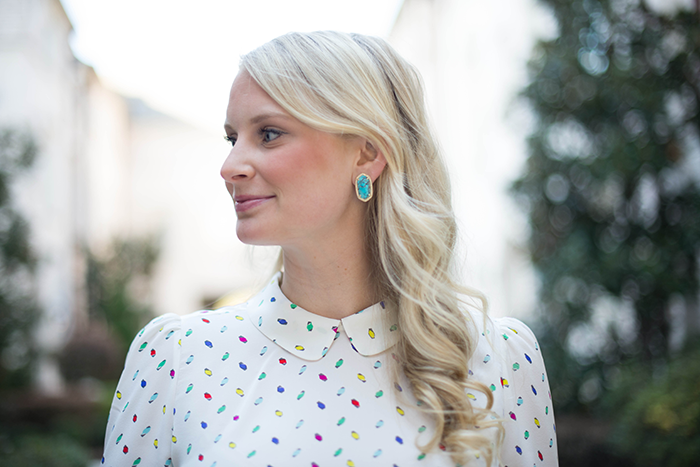 And, the blouse…I feel like Kate Spade can do no wrong. Love the earrings! I have the necklace version and absolutely love it and wear it with so many things! You look great! That skirt is gorgeous!! I love the color and the pockets. Gorgeous outfit! Loving the blouse. If my ears were piereced I’d be all about those earrings. (Weird that I don’t have them pierced, I know). What an adorable combo–that blouse is really just perfect! Gorgeous skirt! 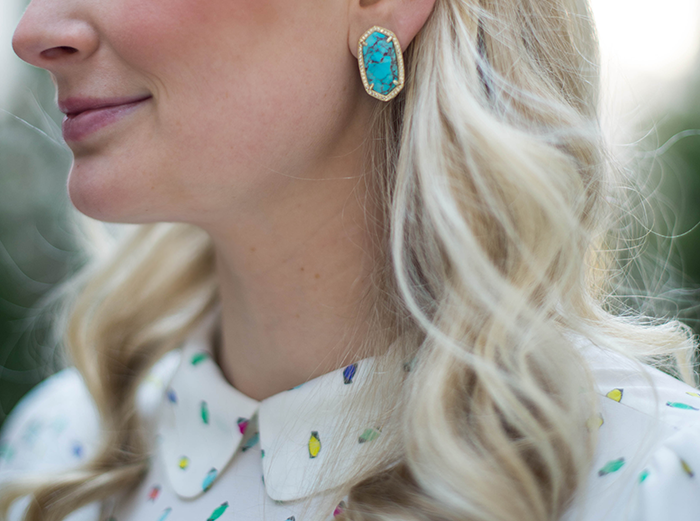 AHH I am such a huge fan of Kendra Scott… Her earrings are just the perfect touch for any outfit. Merritt! This is outfit is amazing, by far one of my favorites! That skirt is incredible! Love your outfit! Those earrings are adorable too! Thumbs down to Monday.. boo.. But I DO love this look! SO gorgeous! That skirt photographs so beautifully! Such a great look! Love a skirt with pockets! The color is nice too. Seriously such a beautiful & chic look. Loving that blouse and skirt – can be worn mixed and matched in so many ways. Great giveaway too, wish me luck! i love your hair in these pictures, are you doing something different? Those earrings are amazeballs, such a fun giveaway! That skirt is absolutely stunning on you! Love J.Crew anything and the top is so pretty! wow Merritt! You look gorgeous in that beautiful outfit. This skirt makes me wanna sew a similar one for me! Thanks for the inspo. You look so chic, I adore this outfit. Wow, what a gorgeous skirt! Show-stopping. The photos turned out so well!!!! That Kate Spade blouse is amazing. I love how lady like this season it. this skirt looks so regal! i’m inspired to try this look for an upcoming brunch! This is such a pretty and ladylike look but still so fun with that adorable top! Amazing Earings! Thanks for the giveaway! I am the same way about Monday’s, but today I was excited to publish mine as well. Two of my favorite stores combined in one outfit and you look astonishing. Very classy, and I agree, that color is so rich. Two of my very favorites in one outfit – J. Crew and Kate Spade! You just don’t get any better. Love that blouse! This outfit is SO ladylike and chic! I would love to wear something similar for Easter! Any skirt with pockets is the perfect skirt to me!! Love the pretty red color!